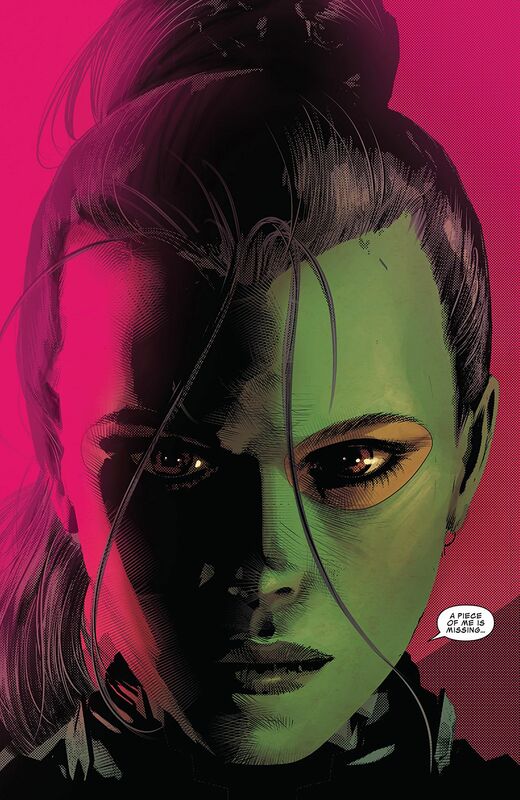 THIS REVIEW OF ‘INFINITY WARS PRIME’ #1 AND ‘INFINITY WARS’ #1 CONTAINS SPOILERS. By Don Alsafi. Back in March Marvel released Infinity Countdown #1, the beginning of their latest cosmic event saga. Or rather that’s what you might have expected; the actual start was in Infinity Countdown Prime, which came out a few weeks earlier. And look, we can understand Marvel’s intent here: Since most series always start with a high number of orders, and then (as is typical) gradually drop as the title goes on, one assumes this is the publisher’s way of getting two #1 issues in a row, and thus hopefully forestalling that standard attrition for another month. 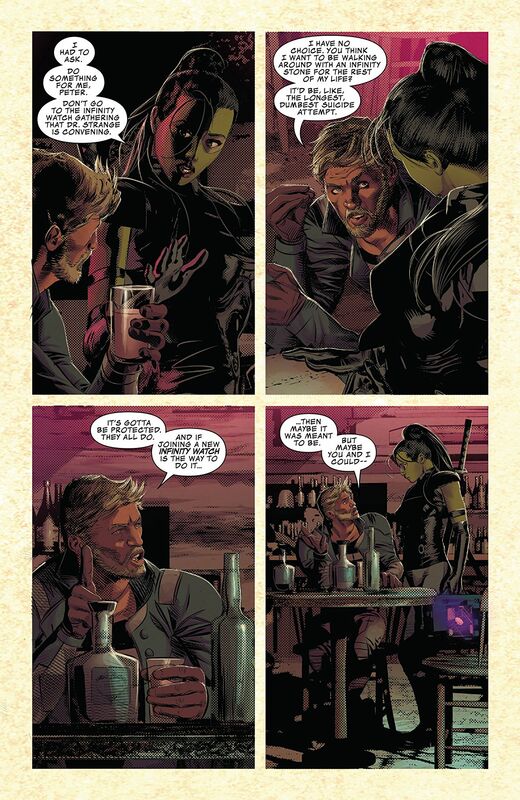 So not only was Infinity Countdown #1 telling a story that was already in progress, it was also culminating long-running plot threads that had been building over the previous year in the pages of Guardians of the Galaxy. There were giant battles taking place across multiple planets, there was an overly large and unwieldy cast (many of whom issue #1 of Countdown neglected to introduce), and there was generally little effort made in catching new readers up to speed. It was, all told, a bit of a mess. Then a couple of weeks later Avengers: Infinity War hit theaters, fully cementing Thanos as the ultimate Big Bad of the MCU. Infinity Countdown not only continued on, but in time announced what the prelude mini had been counting down to. And, perhaps taking a cue from the recent film, the name of this newest cosmic saga was revealed to be Infinity Wars. 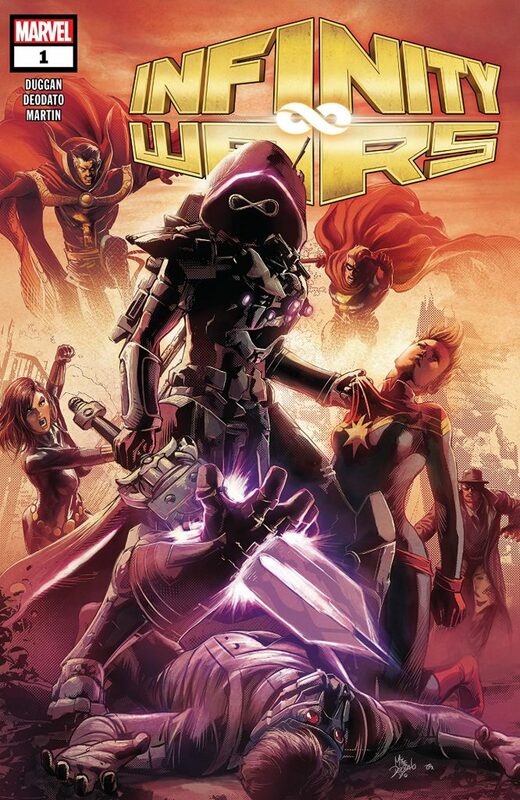 So, last week Infinity Wars Prime was released, and this week the main event kicks off with Infinity Wars #1. Infinity Countdown wasn’t the most comprehensible without having read the previous year’s worth of space shenanigans—but if we didn’t proceed any further with that prelude, will Infinity Wars be any more explicable? The proof, as they say, is in the space pudding. (Actually, nobody says that.) So let’s find out…! Letters by VC’s Cory Petit. More recently, the Infinity Stones (—and why exactly did the MCU rename them as “Stones”? Has this ever been discussed?) were apparently destroyed, reborn, and subsequently found/claimed by a new set of guardians. So in Infinity Wars #1, Doctor Strange has called together all the current Stone-bearers—a brand new Infinity Watch, he states—with a plan to take these massively powerful artifacts away from Earth. Because, he’s recently come to discover, something is coming. Something big. These opening two issues have a lot packed into them—and with Prime‘s 30-page count and #1 clocking in at 36, they clearly needed all that space. The Prime issue begins with Loki poring through ancient Asgardian tomes, confused as to why stories are never the same as he remembers them (a bit of comic book meta-commentary, perhaps? ), and questing to find his answers in the origin of Creation itself. Meanwhile, Doctor Strange aids Adam Warlock with investigating a corruption inside the inner world at the heart of the Soul Stone, leading him to glimpse a threat truly terrifying in its power. And Thanos is about to lead his followers on a brand-new campaign of conquest and destruction—when a new player on the scene, Requiem, impales the cosmic villain on her sword and then, with awesome finality, decapitates him. Tense, moody and personal. Though Infinity Countdown #1 was frustratingly obtuse, take heart—for these first two issues of Infinity Wars are anything but. Though action scenes abound, writer Gerry Duggan acquits himself far more admirably this outing by employing a more measured pace which not only catches readers up to speed with elegance and grace, but gradually and increasingly amps up the feeling of dread brought on by the looming crisis. By the end of issue #1, Requiem has revealed her true identity to the Infinity Watch version 2.0, and the comic ends with her delivering what looks to be a killing blow to yet another major character. 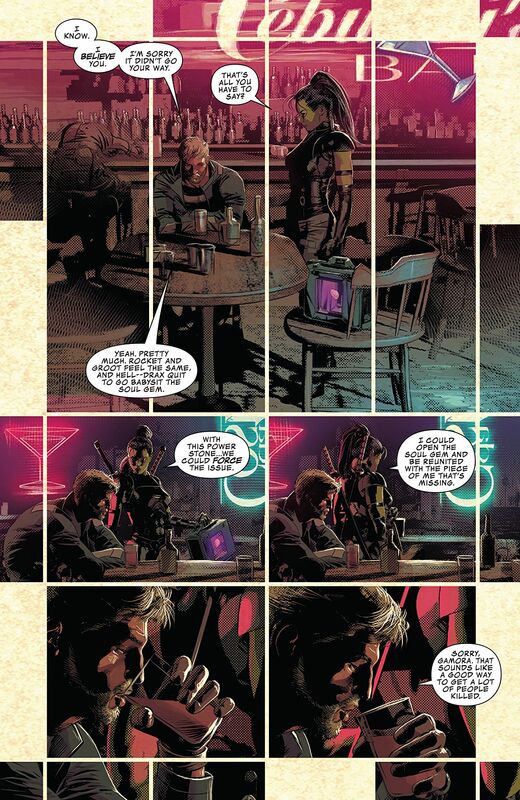 The artist for Infinity Wars is Mike Deodato Jr. (with moody colors by Frank Martin), who illustrated the prologue and epilogue pages in Countdown #1. His penchant for photorealistic expressions and a fondness for heavy shadows might not be the visuals you’d instinctively think of when conceiving an epic cosmic saga—but, y’know, maybe that’s the point. Because although the gathering threat is intimidating in its power, Duggan takes the time to let us get to know all the major characters involved, and how the situation at hand is one in which many of them have incredibly personal stakes. For that, you need heroes (and villains) you can feel something for, and a rising atmosphere of tension. At this, Deodato and Martin excel. Our fate in the hands of heroes… and crooks. 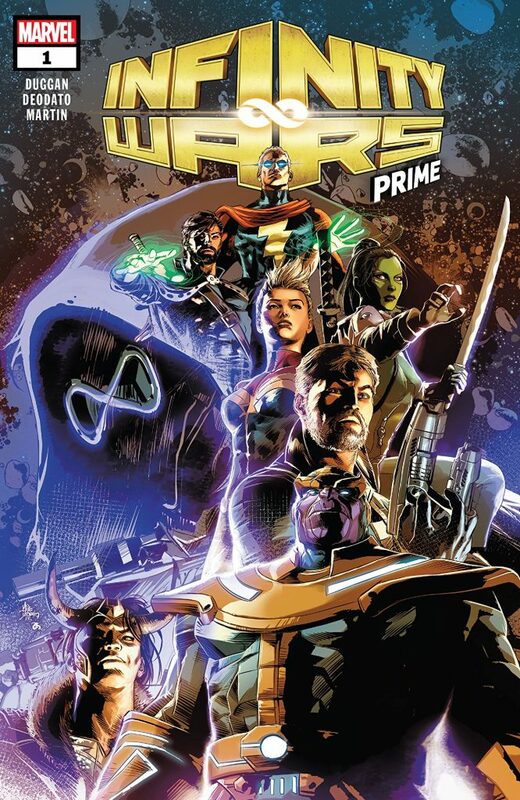 In this, then, Infinity Wars is not your typical event book, or your typical cosmic book. Superhero comics set in space don’t always have the easiest time in the market—due, perhaps, to taking place far away from Earthly concerns, and thus also from a lesser ability to cross paths with the publisher’s other heroes and villains (the shared world aspect being one of the bonus elements so enjoyed by superhero fans). But while five of the six stones are guarded by Star-Lord, Captain Marvel, Adam Warlock, Doctor Strange and the Black Widow… the Mind Stone is, improbably, held by Turk Barrett: the petty criminal and frequent informant first popularized in Frank Miller’s seminal run on Daredevil. Although this pairing seems ludicrous at first blush, from a narrative standpoint it’s genius. After all, the other five Infinity Stones are possessed by heroes who believe in doing the right thing for the greatest number of people. Turk, on the other hand? Turk is watching out for Turk—and when he arrives at Doctor Strange’s meeting, he brings with him a bevy of Marvel villains for backup, like Bullseye, Sandman, Typhoid Mary and Tombstone. To say that introducing this less altruistic element inevitably leads to conflict and fisticuffs would be stating the obvious. There are things we can predict, of course—like the fact that Thanos, having been so popularized by the MCU, is unlikely to stay dead for any real length of time. (Prediction: He’ll be back up and running by the end of this saga.) But as to the rest of it? There are so many elements, characters, and developments in play that it’s dizzying to try to anticipate where any of this will shake out, or just where these Infinity Wars will take us. Based on these first two issues alone, though, it’s sure to be exciting.